Festival themes have intrigued us since the very first festival. In the first festival programming guide, beloved TCM Host Robert Osborne dubbed the first year as “four days of…classiccinemania!” That’s pretty much what it’s been since then! In 2010, instead of one over-arching theme, there were “Programming Listings” featuring Discoveries, Essentials, The Film Foundation, The Hustons: A Hollywood Dynasty, Hollywood on Hollywood, Imports That Influenced Hollywood, Moguls & Movie Stars, Special Presentations, and Vanity Fair’s Tales of Hollywood. Festival App for Iphone arrives. 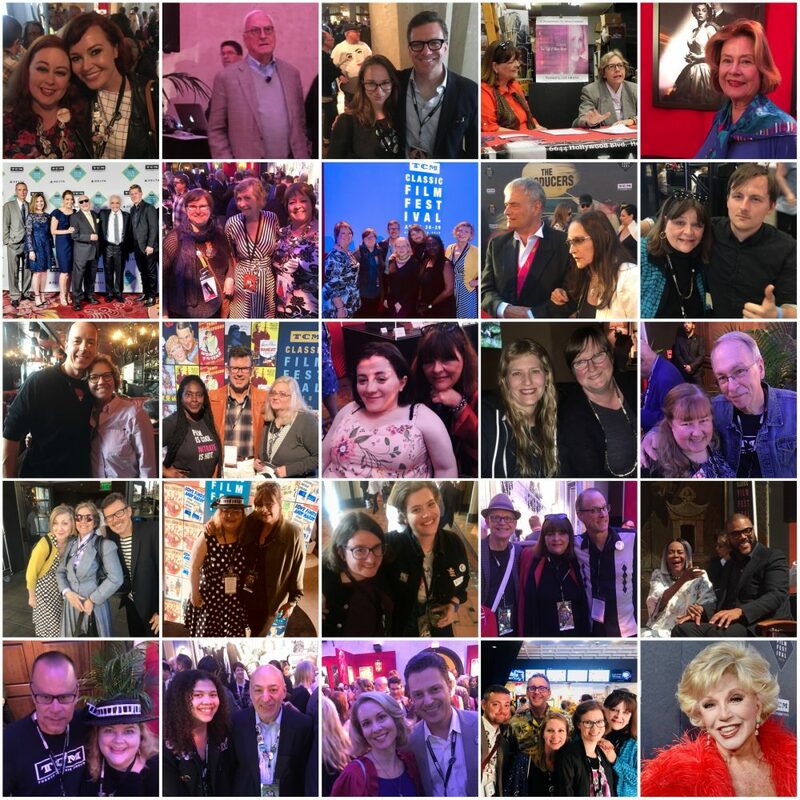 Seeing all of these celebrities: Tony Curtis, Luise Rainer, Tab Hunter, Hayley Mills, Esther Williams, Betty Garrett, Ernest Borgnine, Curtis Hanson, Martin Landau, Eva Marie Saint, Frank Capra III, Tom Capra, Buck Henry, Leonard Maltin, Peter Bogdanovich, Suzanne Lloyd, Cari Beauchamp, Stanley Donen, Nancy Olsen, Margaret Bodde, Illeana Douglas, Casey LaLonde, Eli Wallach, Cheryl Crane, Juanita Moore, Jean-Paul Belmondo, Donald Bogle, John Badham, Norman Lloyd, Danny Huston, and Anjelica Huston were guests. My favorite moments from all of the festivals? Meeting new friends and connecting with virtual ones. Seeing Betty Garret look wistfully at the poolside screening of Neptune’s Daughter during the “Baby, It’s Cold Outside” number and she watched from her Cabana patio. She smiled at me with tears in her eyes, turned around slowly, and went back inside her room. Sweet. Seeing Robert Osborne in person, interviewing Luise Rainer, Juanita Moore, and Susan Kohner was a joy. The Vanity Fair party rocked! In 2011, pass holders found Discoveries, Disney’s Musical Legacy, Essentials, A Celebration of Bernard Hermann, Nice Work If You Can Get it: The Film Music of George and ira Gershwin, Happy Trails: Roy Rogers’100th Birthday, The Silent Legacy and Special Presentations. Hand and Footprint Honoree: Peter O’Toole. My favorite moment? Shaking Peter O’Toole’s hand and meeting Lesley Caron. The Vanity Fair party was exciting! 2012 brought Built By Design: Architecture in Film, Deco Design, Discoveries, Essentials, The Films of Stanley Donen, The Legendary Costumes of Travis Banton, The Noir Style, The Paramount Renaissance, Special Presentations, and Universal’s Legacy of Horror. Hand and Footprint Honoree: Kim Novak. Favorite moments: Meeting A. C. Lyles in the lobby of the Chinese after a screening of Wings;Meeting Peggy Cummins as she arrived from London at the Roosevelt. 2013, Cinematic Journeys: Travel in the Movies, gave us Discoveries, Essentials, Festival Tributes, Journeys of Self-Discovery, A Journey to Italy, Lovers On The Run, Riding The Rails, River As Road, and Special Presentations. Hand and Footprint Honoree: Jane Fonda. Seeing Shirlee Fonda, Jane Fonda, and Peter Fonda walk over to their father’s Hand and Footprints impression, and Shirlee Fonda showing me a photo from the day Henry Fonda was honored in the Chinese Forecourt. Meeting Ann Blyth in the lobby of the TCL Chinese was a dream come true! So much is going on in this photo: Margaret O’Brien, Tippi Hedren, Kim Novak, and more! Miss Theresa Madere Barrera on the Red Carpet 2014…. Families in the Movies, 2014, included titles relating to Single Mothers, Festival Tributes, Essentials, Discoveries, Daddy/Daughter Films, Aging Parents, Sister Acts, Dysfunctional Families, and Special Presentations. Hand and Footprint Honoree: Jerry Lewis. Meeting Maureen O’Hara for a brief moment, and hearing her interview with Robert Osborne. Exciting lobby photo ops with media moguls and mavens…. 2015 brought pass holders a Festival App. History According to Hollywood screened features focusing on History According to John Ford, Discoveries, Special Tributes, Fight The Power-Films About Revolution, History on Trial, and Herstory. Hand and Footprint Honoree: Christopher Plummer. The Peter Fonda interview in Club TCM, and The Picture Show Man, a fabulous Rod Taylor film discovery for me from Australia! In 2016, Moving Pictures included topics like Inspirational Sports Movies, Animal Movies, Religious Films, Love and Loss, Coming-of-Age, Festival Tributes, Discoveries, Essentials. Hand and Footprint Honoree: Francis Ford Coppola. Fave moments: Meeting Carl Bernstein, Elliot Gould’s interview in Club TCM, Meeting Carl Reiner. By 2017, it was time to Make ‘Em Laugh: Comedy in the Movies, bringing Dark Comedies, Divorce Remorse, Movie Spoofs, Nitrate, Hey-That’s Not Funny, Special Presentations, Discoveries, Essentials, and Festival Tributes. Hand and Footprint Honorees: Carl and Rob Reiner. Seeing Stalag 17 and Dr. Strangelove with my son who lives in L.A.
Last year’s theme for 2018, Powerful Words, The Page Onscreen illuminated Christie’s Mysteries, Hardboiled Hollywood, Shakespeare in the Dark, The Poet’s Corner, The Power of the Press, Writer’s Block, Special Presentations, Nitrate Films, Discoveries, and Special Tributes. Hand and Footprint Honoree: Cicely Tyson. Fave moments: Scandal: The Trial of Mary Astor documentary, an interview I conducted at Larry Edmunds with Director Alexa Foreman, the Janes Ivory interview in Club TCM, a conversation with Gillian Armstrong, the screening of My Brilliant Career, a conversation with Robert Benton. UPDATE AS OF August 28 at 11:15: The TCM Film Festival Theme for 2019 is…Follow Your Heart: Love At The Movies. Wish I had started going sooner! Thanks for giving me an idea of what the festival was like prior to when I started going.